Going grain-free and specifically going SCD means about half of the supermarket isles are off limits, but walking past the bakery and bread areas, smelling these beautiful ‘freshly baked’ scents can cause even the strongest willed person to ‘slip’. Bread is such a staple food and sandwiches are such an easy ‘on-the-go’ kind of food that I really wanted to find a recipe for a good substitute. I found that loafs based on ground almonds come out quite wet, don’t hold their shape very well and tend to crumble, so when I came across this recipe by Brittany I instantly tried it with great success. The only thing was the cost and availability of the ingredients. Raw almond butter isn’t readily available in UK supermarkets and it isn’t cheap when you do find it, so I decided to make my own. Using a powerful food processor, you can make your own nut butter. Depending on the toughness of the nut, it can take between five and 15 minutes. I found that adding cashew nuts to the ‘buttering’ process results in a fluffier bread and adding herbs and spices reduces the ‘eggy’ smell and flavour. Olives, walnuts, sun dried tomatoes and even sweet additions can be made for added flavour. 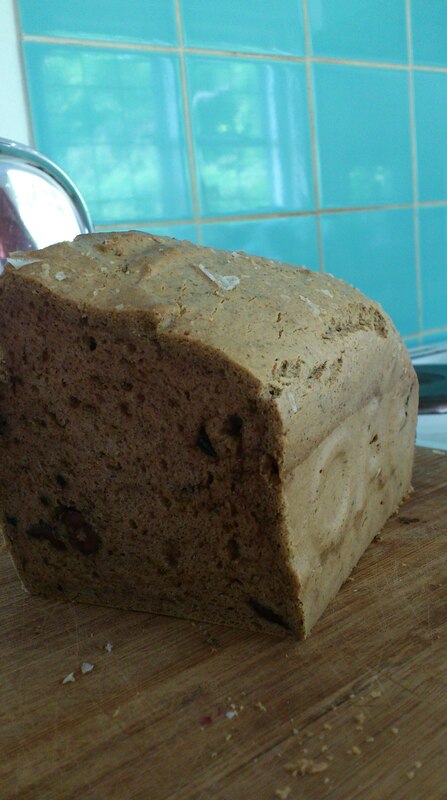 The bread also slices nicely and as it’s a dense, nutty and not so low on fat, a little goes a long way. I like using the bread to make Smörgåsbord style open sandwiches for brunch. Makes one ‘Loaf’ tin which results in about 20 slices. It’s worth reading Brittany’s notes about which pan to use. Heat the oven to 170˚c. If using a non-stick pan, line it with parchment paper. Measure the raw almonds and cashews into your food processor and turn it on. It’s a loud start so don’t be startled. Continue processing for about 10-15 min until the mixture transformed from crumbs, to a dough-like ball and then into a creamy butter texture. Your food processor will probably heat up, so be careful and don’t panic if you see steam rising from the bowl. With the processor still running, add the eggs and measure in the rest of the ingredients. You will have a thick and gloopy (but not lumpy) batter. If adding olives or other flavours, pulse them in now (Don’t over work them, just mix them in). Pour the batter into the loaf tin and bake for 45 min, checking a toothpick comes out dry before removing from the oven. The bread doesn’t brown so much on the top. Let it cool for 5 min, then remove from the tin onto a cooling rack. Storage: The bread keeps for 5-7 days in the fridge, wrapped in a layer of parchment paper, then covered with a layer of aluminium foil.